"Bay View Resort" Lamai which gently slopes to the sea with 9 small private beach is located a short distance from the main road between Lamai and Chaweng, just 2 kms from Lamai centre. Bay View Resort currently offers 23 separate bungalows on an area of 6,000 square meters which guarantee real privacy and an undisturbed holiday. Authentic Thai food with daily changing "Today's specials" is lovingly prepared to guests wishes and served in the homely restaurant. Of course European food is available for those who prefer to eat as though they are at home. The Standard bungalows have been built with the budged conscious traveler in mind. Nevertheless they are still comfortable, clean and do guarantee for a hassle free holiday. The bungalows offer a fully regularly fan, double bed, mini-bar and tee/coffee making facility. As well as in all other rooms you will find hot water also in these bath rooms. The Standard bungalows have been built with the budged conscious traveler in mind. Nevertheless they are still comfortable, clean and do guarantee for a hassle free holiday. The bungalows offer a fully regularly air conditioner, double bed, mini-bar and tee/coffee making facility. As well as in all other rooms you will find hot water also in these bath rooms. Our Seaview bungalows are the ideal choice for a relaxing holiday for just the two of you. The furnished bungalows offer a fully regularly air conditioner, double bed, mini-bar and tee/coffee making facility. Of course you will find hot water also in these bath rooms. As well as in our Beachfront bungalows, you can enjoy a unobstructed daily/nightly view over Lamai Beach. An experience you will treasure for a long time to come. These newly built Bungalows comply to all expectations you have for comfortable lodging. Set amidst a tropical garden they are similar to our beach front Bungalows in size and facilities. Our Beachfront bungalows leave nothing to be desired for, when you either stay with your spouse alone or bring your children along. The comfortably furnished bungalows offer a fully regularly air conditioner and fan, double bed, mini-bar, cable TV, radio/tape and tee/coffee making facility. Of course you will find hot water in all of our bath rooms. Harmoniously embedded in gorgeous nature, our bungalows prove to be the ideal place to escape the hasty working days. Feel free to enjoy a glass of wine on your spacious terrace while watching romantic sunsets. From the noise of the roads and entertainment areas and relax at our quiet private garden or our newly build swimming pool. Our guests can enjoy swimming in the first 100 % chemical free swimming pool in Thailand delivered and serviced by Eco Smart. With its friendly service offers you delicious Thai cuisine and will be happy to full fill your culinary wishes as desired. All ingredients are delivered daily to provide you with the freshest vegetables and seafood, prepared perfectly by our chef. The rooms are furnished with a king-size bed, fan or air-condition, bathroom and balcony and have sea view. Enjoy all kinds of massage in our Private Sala located directly on the beach with a wonderful view over the ocean and the bay of Lamai. Rejuvenate in a superbly tranquil and peaceful environment. 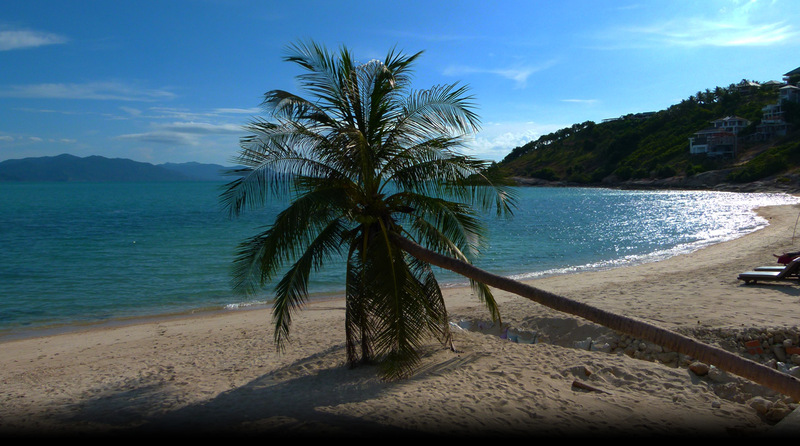 Located directly on the beach between Lamai and Chaweng (But just 2 kms a way from Lamai center).